Reweaving lost images of women into humanity’s cultural threads. On Sunday night Sisters of One Eye Performed “Living Strong Throughout the Land;” for me this was the high point of the festival. The performance was a truly inspired and magical blend of dance, music, poetry, visual arts, storytelling and mime. I was totally enthralled from the opening sequence and held captivated throughout the performance. This is feminist, visionary performance art at its very best. The quality of the music, choreography, lyrics and dance is exceptional and the message is one of empowerment for all women…No words can do justice to “Living Strong Throughout the Land.” Writing this, days after the event, I am still absorbed by the images and feelings evoked by the artists….It feeds and nourishes us with hope and a sense of continuity and endurance. I came away filled with wonder and elation and an overwhelming admiration for the talent, energy, spiritual strength, vision and commitment of the entire company of Sisters of One Eye. If you ever get a chance to see them, drop all other plans, find however much it costs and just GO. Sandra Kammann, founding Artistic Director, returned from dancing professionally in NYC in search of a deep wellspring of inspiration for her creative work. Embracing multiple forms of training in both performance and ritual studies, she developed and honed her artistic voice. Sandra founded Sisters of One Eye dance/theatre troupe in 1986 to participate in the second annual Voices Burning Women’s Theatre Festivalin Washington, D.C. A year later, the troupe premiered “Living Strong Throughout the Land,” a full evening work of original theatre, contemporary dance and live music, which toured the region from 1987 -1992. A performance for The National Women’s Studies Association National Conference was honored with a standing ovation by the 500 attending scholars. 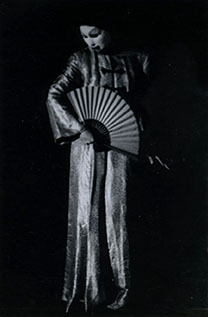 Sandra continued to create new works for her company, including the temple scenes in her signature work, Crack Between the Worlds: the goddess returns in 1997 and 2000. Central to the success of the troupe was Sandra’s long-time collaboration with composer Matt Jones, as well as collaborations with composer Deborah Wicks la Puma and musician/vocalists Amy White and Sheila Equality Thomas. Voices Burning Women’s Theatre Festival ll (Casa del Pueblo Theatre, D.C.), The George Washington University (D.C.), Mt. Vernon College (D.C.), University of Maryland, Johns Hopkins University (MD), Towson State University (MD), University of Pennsylvania Women’s Theatre Festival, Dance Place (D.C.), Adam’s Morgan Festival (D.C.), Sisterfire Festival (D.C.), Red Door Theatre (Detroit, Michigan), Source Theatre: Asian American Theatre Festival (D.C.), and other Women’s Theatre Festivals & Retreats in Maryland, Washington DC and Pennsylvania.